All growth is not equal. Before I dive into the specifics of how to build a growth machine, I want to get super clear on the type of growth we’re pursuing. When growth is valuable to the company but not to the user it is often referred to as a "Dark Pattern" - tricking users into taking an action that helps the company’s growth numbers. You or a friend has probably fallen victim to this at some point, signing up for an application only for the company to email or message all of your friends without you realizing it. BranchOut and Brewster are examples from the past 5 years. Both companies went through fast up front growth but ultimately flamed out. When growth is valuable to a user or customer but not the company, it inevitably leads to the company not being sustainable. Many companies will face pricing optimization at some point. Almost any product could grow more just by lowering price. Paying less is definitely valuable to the user, but if the price is so low the company can’t cover costs, then the company can’t stay in business and deliver any value to the user. Is this providing value to the company? Is this providing value to the user/customer? 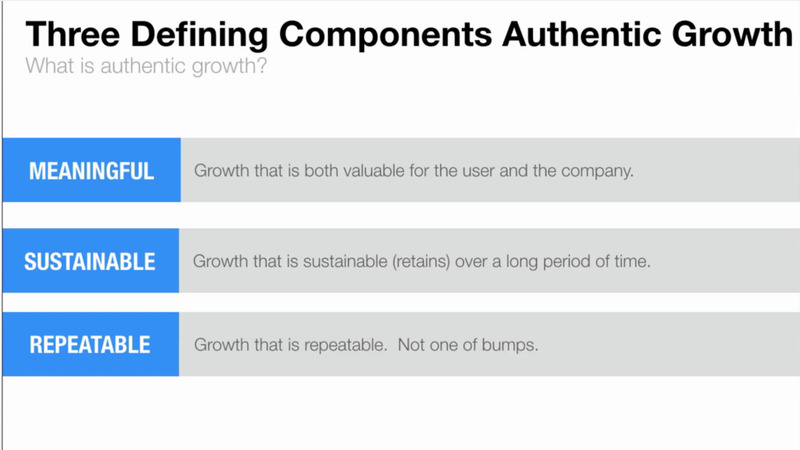 Your growth has to be meaningful to both users and companies otherwise it isn’t sustainable, which brings us to the second part of authentic growth. Sustainability mostly comes down to retention. If you grow users, usage, or revenue but it doesn’t sustain over time, then it will become incredibly difficult to continue growing. Your cohorts of acquired users/customers will need to grow at an increasingly faster pace to overcome losses mounting from previous cohorts. It is important to build retention into key metrics. Tracking downloads, registrations, or installs doesn’t tell you if users retain. In contrast, tracking a metric like Weekly Active Users forces you to track churn alongside acquisition. Though it can be manipulated in the short term, it will eventually fall if users aren’t retaining. Let’s take a look at a hypothetical example. All three of these graphs were generated using the same set of registration and retention data. Here is a graph of a company tracking their total registered users over time. Uh oh. Looks like our growth has completely flattened. Why? Because despite total registered users and new registered users going up, our growth is not sustainable. Users aren’t staying active. As you grow you should be asking yourself: Is this sustainable? Are we retaining users/customers? Retention is the ultimate measure whether you are delivering value to your user/customer over time. I'm not saying you shouldn't pursue PR, App Store features, or Product Hunt but I find a lot of teams spending an unbelievable amount of energy on these initiatives. Those initiatives are not for your growth team. 90%+ of your time should be dedicated to channels and growth mechanisms that drive the engine of your growth machine. These are things that are repeatable. Why Would I Pursue Anything Else? You are probably asking, why would I pursue anything else? I’ll warn you, the force of the dark side of growth is strong. First, it is much easier to grow inauthentically. Producing and improving authentic growth is typically much more difficult. Great teams will take the impactful, hard problems head on. Mediocre teams will shy away and try to find something easier to work on. Second, inauthentic growth numbers always sound more impressive. This typically produces what I call the Wheel of Meaningless Growth. The pursuit of inauthentic growth eventually leads to the classic startup story of companies such as Viddy, Branch Out, and Homejoy. All three companies raised tens of millions of dollars and got massive amounts of press based on inauthentic growth. They all also went down in flames within a few short years and employees are the ones who lose in the end. So I’ll say it one more time, pursue authentic growth. Throughout Building A Growth Machine, I’ll point out the traps of inauthentic growth and help you learn to build authentic growth for your company. This is one post in a forty part series diving into the details of how to build a growth machine for your product and company. Subscribe below to get every post of the series including videos, templates, and more?